At Spitfire, there’s no hiding the fact that we get giddy about glossy brochures, punchy postcards, clever videos and cool web portals. But, sometimes a text message can be the most effective way to get a quick message out – and enhancing your communication strategy gets us really excited! A text message can be a great way to send a reminder, reinforce a key message, or notify employees about an important event or deadline. As more employees are working remotely or on-the-go, a text can be an ideal alternative, or addition, to posters hung by the coffee station, table tent cards in the lunchroom, or even an email with important benefit details. Why Send a Text to Your Employees? Text messages are opened 98% of the time compared to 15-20% for emails in general. About half of employees open internal email communications. As employees are trending toward appreciating personalized messages more, it can be a quick way for HR or senior leadership to send a targeted message to a group, individual employee or prospect. It’s another touch point that can help employees feel connected and valued. Consider incorporating text messaging into your internal communication toolbox. You may choose to deliver messages directly to employer-provided cell phones, or you can request employees subscribe to receive messages by texting a keyword to a designated code. For example, you could reserve the keyword: BENEFITSCOMM, and ask employees to sign up to receive text messaging by texting this word to a certain number. Send Important Reminders – Consider sending a text message to remind employees about an upcoming employee meeting or an important deadline. 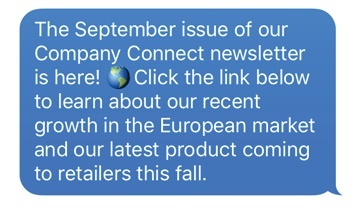 Reinforce an Announcement – Maybe you just launched a new website or the latest issue of the Company newsletter. Drop a quick text with a link and an informal announcement. Emergency Notifications or Updates – Need to reach employees quickly with an important message? Try sending a text to let employees know the office will be closed due to inclement weather, or the network server is down. Give a Quick Morale Boost – A great way to keep employees engaged and connected is to reach out to them periodically with a quick upbeat message, such as a holiday greeting, an inspiring quote, or a company-wide pat on the back. 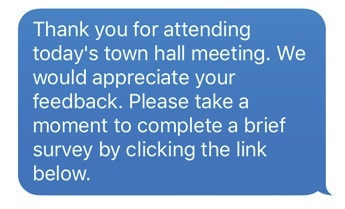 Gather Feedback – Sending brief surveys via text message will generate a high response and ensure quick results. Consider asking for feedback on a recent activity, or soliciting votes about employee preferences. Now, we're not suggesting you nix the emails, podcasts and flyers all together. Text messaging is simply another communication channel to consider adding to the mix. It can be a great way to reinforce your messages, grab employees’ immediate attention and further promote engagement.